Llanwrtyd Wells has completed its wall hanging square to join the national wall hanging.The art work was designed and made by the Sewing and Handicraft group in Llanwrtyd Wells. 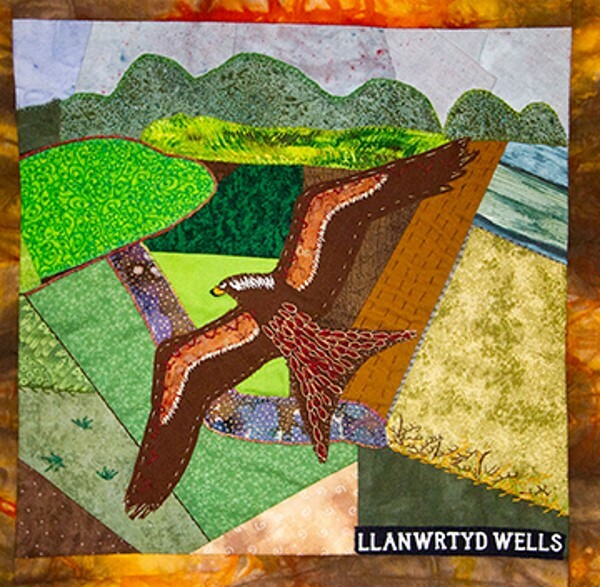 The square depicts a Red Kite above mountains, patchwork fields and a river in the Cambrian Mountains. The Red Kite is the iconic bird in Powys. The Kite was persecuted almost to extinction and the last remaining pair survived in the hills above Llanwrtyd Wells. There are now 1600 pairs in Great Britain and they are protected under a Schedule 1 of the Wildlife and Countryside Act 1981. They are a constant presence in the landscape and beautiful to watch as they effortlessly glide over our hills and fields. They are one of the great conservation success stories of recent times.